Home > Guide > 5 Ohio Playgrounds Worth-the-Drive Take your kids to one of these wow-worthy playgrounds! 5 Ohio Playgrounds Worth-the-Drive Take your kids to one of these wow-worthy playgrounds! 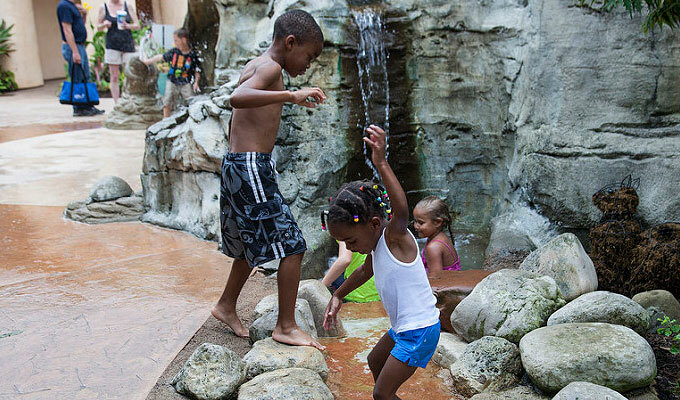 Plan ahead your weekends to check out these 5 Ohio Playgrounds that are worth the drive! This brand-new playground features slides, swings, climbing structures and gorgeous views of the Cincinnati skyline. This park is best-known for its goats, which roam the hills behind the Carillon tower. Located just outside of Columbus, this playground is worth the drive. A mix of natural, traditional and futuristic elements make this playground truly one-of-a-kind. One side contains a colorful playground built on a rubberized surface. There are interactive, electronic games, musical instruments, and tons of spinning, slide-able and climbable structures. The other side is inspired by nature, with plants, slides, a stream, water pump and sandy area all mixed together. Located downtown, this park has it all: spraygrounds, playgrounds, larger-than-life games and musical instruments and even a flying pig. With lots of greenspace to enjoy a picnic, access to riverfront sidewalks and the Purple People Bridge and an indoor carousel, you can easily make a day out of this Cincinnati Park. What can we say — we adore this playground. Its features include a play castle, climbing wall, sandbox, dual slides, a canal boat in a stream and musical instruments – all creatively integrated into a safe and imaginative play environment for children of all ages. The play area is programmed with free activities for all families to enjoy — like craft-filled Saturdays and family movie nights in the summer. 7 Things to do in Ohio’s Largest Playground Visit Warren County this summer!